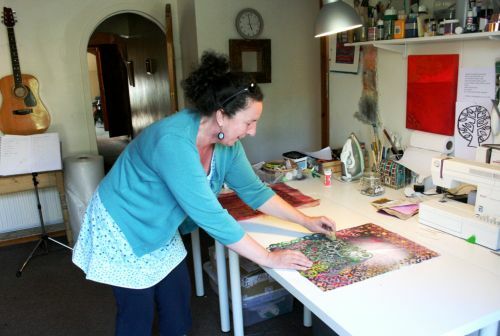 Angie is a textile artist and tutor, who lives and works in Ledbury, Herefordshire. She has been interested in textiles since she left school although only discovered creative embroidery in 1994 when she began studying City & Guilds at Malvern Hills College. While a student she won the prestigious Charles Henry Foyle Trust Award for Stitched Textiles with her piece 'Unfolding Word' and had 'Shroud' accepted for Art of the Stitch. She carried on her studies at Gloscat with Liz Harding after which she discovered a talent for teaching. Her artwork is inspired by many themes but particularly poetry or text and the natural world, particularly plant forms. Angie has recently enjoyed developing work that focuses on gardens that were once tamed but struggle and often succeed in becoming wild. She enjoys the juxtaposition of randomly ‘placed’ plants alongside the order the gardener tries to contain. Imagining these gardens in shadowy moonlit illumination, her colours have become almost monochromatic, silvers and blacks and those hard to name colours when light has faded. From drawings and photography Angie has developed her visual ideas through embroidery inventing simplified botanical forms. This recent work has seen her explore discharged and painted velvets, use heat transferred foils and layered organza which becomes intensely machine embroidered. She teaches to Guilds and groups all over the country, and has been teaching in Australia and New Zealand. She has written a book called ‘Stitch Cloth Paper and Paint’ a current best seller for Search Press.